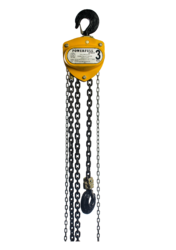 We are a leading Manufacturer of lc series chain pulley block, isi marked medium duty chain pulley block-3ton x 3mtrs lift, manual trolley - capacity - 0.5t x 3mtrs lift and isi marked light duty chain pulley block from Mumbai, India. 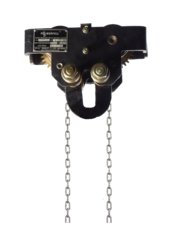 With the support of modernistic infrastructure system, we are engaged in manufacturing and supplying superb quality Light Compact Chain Pulley Block. These blocks have profound uses in material handling process in various industries for carrying heavy weight loads. Due to their fabrication being done as per latest industrial norms, these blocks are resilient and have precise controls. Moreover, these are offered to customers in tamper-proof packaging at nominal price tags. Owing to our industrious team, we are able to offer the clients a meticulous array of Manual Trolley. Owing to the latest technologies employed, this Manual Trolley provides long lasting functional life and can be easily operated. Our Manual Trolley has high-grade brakes that are built in and provide both electric and hydraulic input. 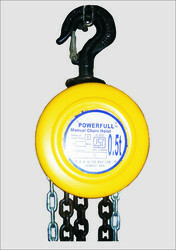 This Manual Trolley is applicable in mobile cranes, drilling rigs and material handling trolleys.